Background: Tibial nonunions remain a significant and challenging clinical problem. Nonunions occur due to a failure of biology, a failure of biomechanics, or both. The cells in and around the nonunion site have an osteogenic potential that can be activated when torsional, axial, and shearing instabilities are eliminated by establishment of an appropriate biomechanical milieu. Hexapod external fixators may be able to provide this milieu. Materials and Methods: In this retrospective study, consecutive patients with tibial nonunions treated in a single center were analyzed. They were all treated by the application of a hexapod circular fixator before deformity correction and distraction. This was followed by functional rehabilitation. We determined general health status with the use of the Short Form 12 measurement tool. Results: A total of 32 patients with 33 stiff hypertrophic nonunions were treated with circular fixators. The average age was 44 years, there were 24 males and 8 females. Out of the 33 nonunion cases, 29 united with closed distraction only; 3 required bone graft and 1 underwent amputation. The average time to union was 170 days. Overall on the final examination, all patients had a health status that was similar to the general population norm. Conclusion: A success rate in excess of 80% can be achieved with mechano-biological manipulation using hexapod external fixation in tibial nonunions without bone grafting. Tibial nonunions remain a significant clinical problem. This condition can be challenging and costly to manage. Currently, the accepted definition for nonunion of the United States Food and Drug Administration (1986) defines a nonunion as 9 months having elapsed with no progression to union in the preceding 3 months. The treatment of tibial nonunions is still a challenging task as there is currently no standardized method to treat this complex problem. The use of a circular fixator to allow distraction to stimulate bone healing is one of the proposed treatments for tibial nonunions. A treatment algorithm to guide the management of tibial nonunions has been proposed by Ferreira and Marais. After host factors are optimized and infection is excluded, patients with bone loss or defects are treated with a circular frame with possible lengthening or bone transport. Patients who are diagnosed with stiff hypertrophic nonunion are treated with a circular frame with distraction osteogenesis or hexapod frame if a deformity is present. Those with mobile/atrophic nonunions are treated with a circular frame with compression and possible bone grafting. In mobile hypertrophic nonunions (“pseudo-arthrosis”) resection of the pseudo-arthrosis is performed and a circular frame applied. Finally, an early rehabilitation program is initiated. This algorithm gives the clinician a thorough treatment protocol for nonunion through the use of a circular frame or hexapod fixator. This study was approved by the local Research Ethics Committee. A retrospective descriptive study was conducted at our limb reconstruction unit. We selected patients with nonunions who were treated by monofocal distraction with a hexapod fixator between 2007 and 2014. A review of their charts and radiographs was performed. A nonunion was defined as a clinically or radiologically un-united fracture that had had sufficient time to unite. The study comprised 32 patients with one patient having bilateral pathology, totalling 33 limbs. Of the 33 tibial stiff hypertrophic nonunions 6 were proximal, 6 midshaft and 21 distal nonunions. We excluded patients with active bone infection, head injury, and upper limb disability as they would have confounded the analysis and added to complexity. Preoperative and final radiographs were evaluated on the standard picture archiving and communication system for alignment, angulation, and radiological union. There were 24 males and 8 females with a mean age of 44 years (18–80 years). Previous treatment included intramedullary nailing, external fixation, plate fixation, and cast treatment. The risk factors for nonunion in this cohort included smoking, high energy trauma, and the location of the tibia nonunions (diaphyseal). 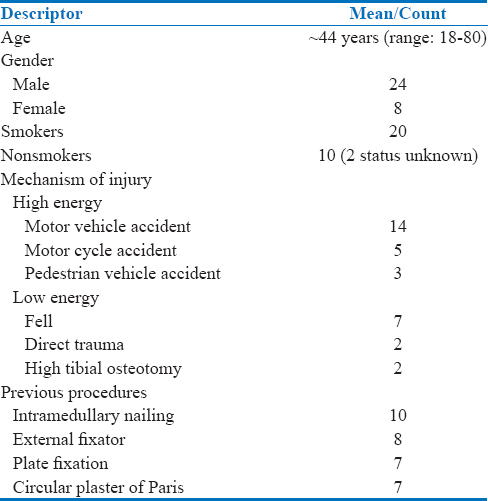 The mechanisms of injury were motor vehicle accidents in 14 of the patients, 5 motor cycle accidents, 3 pedestrian vehicle accidents, 7 due to falls, and 2 varus deformities of the tibia who underwent high tibial osteotomies [Table 1]. We used a standard treatment protocol consisting of hardware removal through the existing scars without disturbing the local biology. A fibular osteotomy was performed in the mid-diaphyseal region using a predrilled osteotomy technique. A hexapod fixator, either a Taylor Spatial Frame (TSF) (Smith and Nephew, Memphis, Tennessee) or TrueLok-Hex fixator (TL-Hex) (Orthofix, Verona, Italy) was used based on surgeon preference for the individual cases, amounting to 29 TSF and 4 TL-Hex fixators. It was applied using rings first method, mimicking the deformity. Postoperative control radiographs were obtained and used with the associated software to determine the correction program as described by Ferreira et al. A software program was created to correct the deformities as measured in the radiographs, as well as to add 8 mm of distraction during the deformity correction. The correction was programmed at a rate of 1 mm/day after a latent period of 10 days. The amount of 8 mm was programmed irrespective of the initial shortening and distraction was maintained until union. Distraction was used only to achieve union and not to correct discrepancies. Patients had early functional rehabilitation which included orthotics, joint range of motion exercises with progression to early weight bearing as tolerated. The progression of the union was monitored with radiographs taken every 6 weeks. Once union was achieved the frame removal protocol included destabilization of the frame for a week before removal in theatre. At last follow up, patients were asked to answer the 12-item Short Form Health Survey version 2 (SF-12v2). The SF-12 is a reliable and a valid generic health related quality of life measurement tool, measuring the physical and mental well-being of the patients, compared to the general population. Scores for the SF-12 physical component summary (PCS) and mental component summary (MCS) scales can range from 0 to 100. The US population mean score is 50 and the corresponding standard deviation is 10; higher scores indicate a better health state. Study population means were calculated for the duration in frame (union time) and SF-12 PCS and MCS scales. Union time and the health status SF-12 scores were compared between smokers versus nonsmokers and open versus closed nonunions by performing the Student's t-test with unequal variances. Union was defined radiologically as trabeculation across the nonunion site on antero-posterior, lateral, internal, and external oblique radiographs. Union was defined clinically as the ability to fully weight bear without pain at the nonunion site. Union was achieved after initial monofocal distraction treatment with the hexapod fixator in 29 out of 33 tibial nonunions [Figure 1]. Average time to union was 158 days [Table 2]. Three of the nonunions needed additional bone grafting and went on to unite at an average of 80 days after the bone grafts were performed. On own request, one patient underwent amputation. The SF-12 scores were calculated for the PCS and MCS scales [Table 2]. When compared with US normative data, all patients PCS and MCS scores were well within the norm except for the patient that underwent amputation. An examination of subgroups showed that patients who smoked had slightly worse PCS scores than non smokers. Smokers on average took 48.59 days longer to unite (P = 0.066). Whether the nonunion was an open or closed fracture did not significantly affect the PCS scores (P = 0.29) or union time (P = 0.44). Of the 33 cases, 32 sets of radiographs were available for analysis. 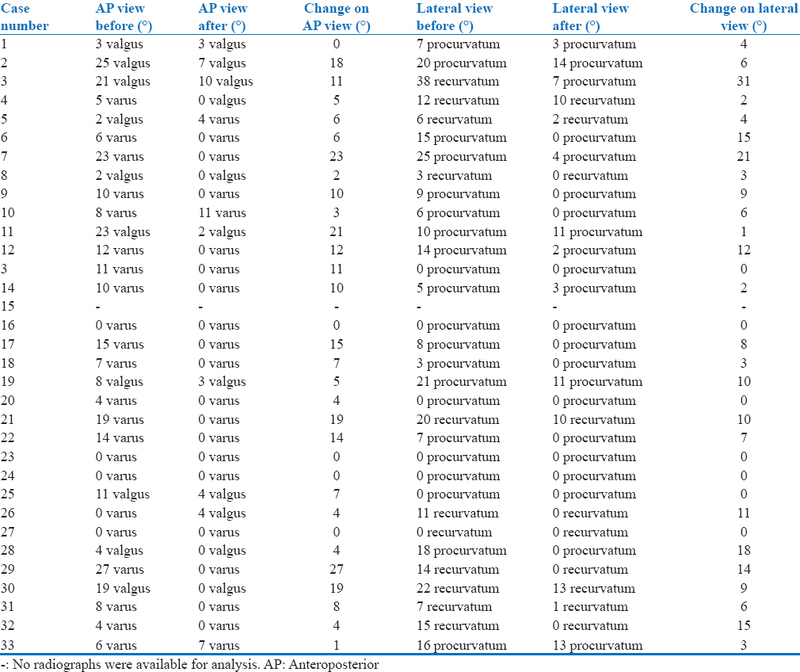 Details of the deformities are depicted in [Table 3]. Four cases had no preoperative deformity and presented with a nonunion only. Of the remaining 28 cases, 24 had multi-planar deformities. The majority of deformities were improved both in position and alignment following treatment with the hexapod. Only 9 tibiae had a residual deformity >5° in any plane following treatment. Following hexapod-assisted distraction, the bony union rate was 29/32 (91%), excluding the patient that underwent amputation. Ten of the 18 cases with leg length discrepancy was restored to within 1.5 cm of the contralateral leg. The remaining 8 inequalities included 4 cases that were corrected with shoe raises and 4 cases that were corrected with subsequent treatment. Five hexapod frame applications had minor pin tract sepsis, and according to the Checketts et al., classification. Other complication included two patients who had breakage of wires which were changed in theatre and subsequently had no further problems. The nonunion rates in the tibia range between 8% and 13% due to the minimal soft-tissue coverage and subcutaneous anterior tibia.,, The traditional Ilizarov method using transosseous osteosynthesis has established successful outcomes in the management of fractures and nonunions. This is due to the low biological footprint, optimal biomechanics and the ability to functionally rehabilitate the patients and induce reproducible healing while limiting complications. Barriers to the implementation of this treatment strategy have been perceptions of complexity, the steep learning curve and complications (pin-site infection and joint contracture). The accuracy of fragment reduction and positioning can be challenging with a standard circular fixation device, as mal-reductions can occur. This fact has led to the development of hexapod (based circular) fixators in an attempt to improve the accuracy of fragment positioning. Frame construction is achieved by adding six variable length struts into the ring fixator as a specialized, three-dimensional hinge. An octahedral hexapod frame results in a parallel kinematic platform being created, which provides the ability for very accurate fragment positioning and manipulation guided by the computer software. The surgeon is able to achieve union and correct the mechanical alignment using the hexapod fixator. With regard to the hypertrophic nonunion, adequate stability provided by the circular fixator creates the ideal environment for healing without interruption of the fracture site. The concept of distraction osteogenesis using ring fixators has been published by a few authors. Saleh and Royston corrected the biomechanical axis simultaneously with distraction and all fractures united. Rozbruch et al. initially reported two cases with hypertrophic nonunion of the tibia with deformity treated successfully with Ilizarov/TSFs using distraction. Later the same authors reported on 38 patients with various nonunions and bone loss. Fractures were treated by distraction and compression and bone grafting, 27/38 United initially and 36/38 patients achieved union after a further intervention. In Kocaoglu's study of 16 patients with stiff hypertrophic nonunions all healed after using distraction osteogenesis to correct all shortenings and deformities. Ferreira et al. reported on 44 consecutive patients with 46 stiff tibial nonunions, treated with hexapod external fixators and distraction to achieve union with gradual deformity correction. Bony union was achieved in 98.7% of the patients, leg-length and mechanical alignment were restored. The success obtained by using distraction osteogenesis to obtain healing can be explained by Perren's stress/strain concept. The fracture displacement (δL) in relation to the initial fracture gap (L) produces strain (δL/L) that can lead to primary bone healing (strain <2%) or lead to fibrous nonunion (strain >10%)., The distraction causes a decrease in the inter-fragmentary motion (δL) and increases the gap between the fracture (L). The favorable manipulation of the stress and strain over the fracture area contributes to a healthy healing environment. Perrenshowed that the amount of strain over a fracture gap determines the tissue produced. Ilizarov used this “tension-stress principle” to promote proliferation of the tissues under controlled tension. Hexapod fixators are well suited for harnessing the healing potential of the strain/tension-stress principle to optimize bone and soft tissue healing. Giannoudis et al. introduced the diamond concept which addresses the cellular environment, growth factors, bone matrix, and mechanical stability that is found in nonunions. Circular fixators are able to eradicate bending and translational shear while maintaining axial micromotion creating a biomechanical environment that is favorable for bone healing and regenerate formation.,,,, By using these devices, union can be achieved, and the concomitant multiplanar deformities that are often present in these cases can be corrected.,,,,,,,,,, The mechanical environment that is created by the distraction allows the body to produce the biology to stimulate bone healing, this concept is referred to as the mechanobiology., We used this principle of manipulating the strain across the fracture site with a circular fixator to achieve union. By creating a stiffer construct, adequate stability across the fracture site was maintained resulting in a sound mechanical and biological environment for healing. The success of this technique is illustrated in our cohort where we were able to achieve union in 29/33 (88%) tibial nonunions. There were 3 cases in which this technique did not work in our series. One patient was an intravenous drug user and underwent a subsequent amputation (at the patient's own request), this patient was a poor host for management with a circular fixator. One patient developed a pseudoarthrosis which was wrongly diagnosed as a hypertrophic nonunion. He required supplementary bone grafting after debridement of the pseudo-capsule. Finally, the patient who had the bilateral high tibial osteotomies needed bone grafting. This was probably an oligotrophic nonunion. This emphasizes the difficulty in classifying these nonunions. There is often overlap among the various types and can easily be wrongly diagnosed. Meticulous care should be taken to ensure the correct patients are chosen for this treatment method and the patients understand the psychological implications which are attached. With regard to the smokers, there was an increased duration to union compared to the nonsmokers. Smoking delays or inhibits bone healing after surgery or trauma.,,, In a systemic review by Patel et al., suggested that smokers have a 40% increased time to union and chance of nonunion compared with nonsmokers. Acceptable tolerances for tibial alignment are 5° in the sagittal (apex posterior or anterior angulation) or coronal (varus or valgus) and are necessary for a normal mechanical axis., Deformities of the tibia result in changes to the mechanical axis with abnormal loading on the joints above and below. Alterations can cause a significant increase in the joint reaction forces and leads to a more rapid progression to arthritis in both the ankle and knee. The technique of monofocal closed distraction treatment of hypertrophic nonunions produces excellent outcomes when used in the appropriate indications. It allows for multiple corrections using a single operative procedure. The disadvantages of donor site morbidity from autograft are prevented and no additional allograft or biological agents are required, making this treatment strategy more cost-effective in the long term. The limitations of this study include its retrospective design. The study also did not include a comparison group that underwent another type of treatment. The SF12v2 health survey was used only once, and thus a comparison for the duration of treatment could not be made. In conclusion, closed distraction with the use of a hexapod circular fixator is an excellent treatment choice for patients with stiff hypertrophic nonunion. Our results contribute to the growing case numbers initially presented by others. Wiss DA, Stetson WB. Tibial nonunion: Treatment alternatives. J Am Acad Orthop Surg 1996;4:249-57. Ferreira N, Marais LC. Management of tibial non-unions according to a novel treatment algorithm. Injury 2015;46:2422-7. Ferreira N, Birkholtz F, Marais LC. Tibial non-union treated with the TL-Hex: A case report. SA Orthop J 2015;14:44-7. Ferreira N, Birkholtz F. Radiographic analysis of hexapod external fixators: Fundamental differences between the Taylor Spatial Frame and TrueLok-Hex. J Med Eng Technol 2015;39:173-6. Ware JE Jr., Kosinski M, Keller SD. SF-12 How to Score the SF-12 Physical and Mental Health Summary Scale. 3rd ed. Lincoln, RI: Quality Metric Incorporated; 1998. Checketts RG, Otterburn M, MacEachern G. Pin tract infection: Definition, incidence and prevention. Int J Orth Trauma 1993;3 Suppl:16-8. Fong K, Truong V, Foote CJ, Petrisor B, Williams D, Ristevski B, et al. Predictors of nonunion and reoperation in patients with fractures of the tibia: An observational study. BMC Musculoskelet Disord 2013;14:103. Mills LA, Simpson AH. The relative incidence of fracture non-union in the Scottish population (5.17 million): A 5-year epidemiological study. BMJ Open 2013;3:pii: e002276. doi: 10.1136/bmjopen-2012-002276. Audigé L, Griffin D, Bhandari M, Kellam J, Rüedi TP. Path analysis of factors for delayed healing and nonunion in 416 operatively treated tibial shaft fractures. Clin Orthop Relat Res 2005;438:221-32. Gubin AV, Borzunov DY, Marchenkova LO, Malkova TA, Smirnova IL. Contribution of G.A. ilizarov to bone reconstruction: Historical achievements and state of the art. Strategies Trauma Limb Reconstr 2016;11:145-52. Saleh M, Royston S. Management of nonunion of fractures by distraction with correction of angulation and shortening. J Bone Joint Surg Br 1996;78:105-9. Rozbruch SR, Helfet DL, Blyakher A. Distraction of hypertrophic nonunion of tibia with deformity using ilizarov/Taylor spatial frame. Report of two cases. Arch Orthop Trauma Surg 2002;122:295-8. Rozbruch SR, Pugsley JS, Fragomen AT, Ilizarov S. Repair of tibial nonunions and bone defects with the Taylor spatial frame. J Orthop Trauma 2008;22:88-95. Kocaoğlu M, Eralp L, Sen C, Cakmak M, Dincyürek H, Göksan SB, et al. Management of stiff hypertrophic nonunions by distraction osteogenesis: A report of 16 cases. J Orthop Trauma 2003;17:543-8. Ferreira N, Marais LC, Aldous C. Hexapod external fixator closed distraction in the management of stiff hypertrophic tibial nonunions. Bone Joint J 2015;97-B: 1417-22. Giannoudis PV, Einhorn TA, Marsh D. Fracture healing: The diamond concept. Injury 2007;38 Suppl 4:S3-6. Perren SM. Evolution of the internal fixation of long bone fractures. The scientific basis of biological internal fixation: Choosing a new balance between stability and biology. J Bone Joint Surg Br 2002;84:1093-110. Perren SM. Physical and biological aspects of fracture healing with special reference to internal fixation. Clin Orthop Relat Res 1979;138:175-96. Ilizarov GA. The tension-stress effect on the genesis and growth of tissues. Part I. The influence of stability of fixation and soft-tissue preservation. Clin Orthop Relat Res 1989;238:249-81. 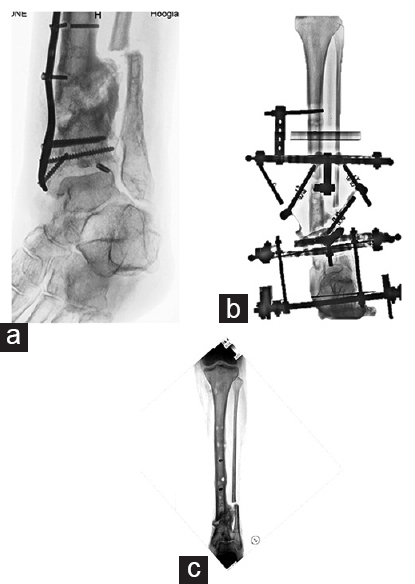 Fadel M, Hosny G. The Taylor spatial frame for deformity correction in the lower limbs. Int Orthop 2005;29:125-9. Bronson DG, Samchukov ML, Birch JG, Browne RH, Ashman RB. Stability of external circular fixation: A multi-variable biomechanical analysis. Clin Biomech (Bristol, Avon) 1998;13:441-8. Watson MA, Mathias KJ, Maffulli N. External ring fixators: An overview. Proc Inst Mech Eng H 2000;214:459-70. Hak DJ, Toker S, Yi C, Toreson J. The influence of fracture fixation biomechanics on fracture healing. Orthopedics 2010;33:752-5. Mitousoudis A, Magnissalis E, Kourkoulis S. A biomechanical analysis of the Ilizarov external fixator. EPJ Web Conf2010;6:21002. Feldman DS, Shin SS, Madan S, Koval KJ. Correction of tibial malunion and nonunion with six-axis analysis deformity correction using the Taylor spatial frame. J Orthop Trauma 2003;17:549-54. Fragomen AT, Rozbruch SR. The mechanics of external fixation. HSS J 2007;3:13-29. Mullins MM, Davidson AW, Goodier D, Barry M. The biomechanics of wire fixation in the ilizarov system. Injury 2003;34:155-7. Moss DP, Tejwani NC. Biomechanics of external fixation: A review of the literature. Bull NYU Hosp Jt Dis 2007;65:294-9. Rödl R, Leidinger B, Böhm A, Winkelmann W. Correction of deformities with conventional and hexapod frames – Comparison of methods. Z Orthop Ihre Grenzgeb 2003;141:92-8. Sluga M, Pfeiffer M, Kotz R, Nehrer S. Lower limb deformities in children: Two-stage correction using the Taylor spatial frame. J Pediatr Orthop B 2003;12:123-8. Binski J. Taylor spatial frame in acute fracture care. Tech Orthop 2002;17:173-84. Docquier PL, Rodriguez D, Mousny M. Three-dimensional correction of complex leg deformities using a software assisted external fixator. Acta Orthop Belg 2008;74:816-22. Ferreira N, Marais LC. Chronic knee dislocation treated with a Taylor spatial frame. SA Orthop J 2012;11:61-4. Ilizarov G. Transosseous Osteosynthesis. 1st ed. Berlin: Springer; 1992. Kloen P, Doty SB, Gordon E, Rubel IF, Goumans MJ, Helfet DL, et al. Expression and activation of the BMP-signaling components in human fracture nonunions. J Bone Joint Surg Am 2002;84-A:1909-18. Al-Hadithy N, Sewell MD, Bhavikatti M, Gikas PD. The effect of smoking on fracture healing and on various orthopaedic procedures. Acta Orthop Belg 2012;78:285-90. Gaston MS, Simpson AH. Inhibition of fracture healing. J Bone Joint Surg Br 2007;89:1553-60. Kwiatkowski TC, Hanley EN Jr., Ramp WK. Cigarette smoking and its orthopedic consequences. Am J Orthop (Belle Mead NJ) 1996;25:590-7. Sloan A, Hussain I, Maqsood M, Eremin O, El-Sheemy M. The effects of smoking on fracture healing. Surgeon 2010;8:111-6. Patel RA, Wilson RF, Patel PA, Palmer RM. The effect of smoking on bone healing: A systematic review. Bone Joint Res 2013;2:102-11. Vaccaro AR. Orthopaedic Knowledge Update 8: Home Study Syllabus. Rosemont, IL: American Academy of Orthopaedic; 2005. Fischgrund J. Orthopaedic Knowledge Update 9. Rosemont, IL: The American Academy of Orthopaedic Surgeons; 2008. Graehl PM, Hersh MR, Heckman JD. Supramalleolar osteotomy for the treatment of symptomatic tibial malunion. J Orthop Trauma 1987;1:281-92.